Learn how to get a Car Loan from Mission Federal Credit Union. Since our founding in 1961, Mission Federal Credit Union has proudly served the local community with Bottom Line Auto Loan Rates Every Day to help San Diego County residents succeed. We’re happy to help our members every step of the way as they search for, purchase and finance a new or preowned vehicle. When it comes to choosing the right auto loan, most people are looking at one of two factors that affect their budget—the auto loan rate and the monthly payment. While the Annual Percentage Rate (APR) ultimately impacts how much you’ll pay over time, 62 percent of survey participants said that the monthly payment is more important to them. This makes sense, as the monthly payment has the greatest impact on your daily life. Even if you have an excellent rate on your loan, a high monthly payment can be difficult to maintain. As a result, most people are more focused on achieving a manageable monthly payment so their auto loan fits within their budget. If you want to know how much your auto loan payments will be, our Auto Loan Calculator allows you to enter all the information—including your down payment, loan rate and term—in order to calculate your monthly payment. Schrock suggests, “It’s a good idea to figure out what you can afford to pay monthly, but you should also consider how the APR affects your long-term costs.” The fact is, the higher your loan rate, the more you’ll pay in the long run. Even if you’re able to keep your monthly payment down with a longer term, making smaller payments for a longer period of time could add up to paying more than you need to pay because of the interest. For example, take a look at two auto loan options for the same car. Even if the APR remains the same (and you’re likely to get a lower APR with a shorter loan term), there’s a significant difference in the interest paid with a longer term. When you’re exploring auto loans, be realistic about your budget and about how long you want to be making car payments. A low monthly payment may be attractive, but if you have to stretch out your term in order to make the payments, it may be more car than you can afford. Try using our “How Much Car Can I Afford” Calculator to help you make the right choice for your budget. Before you choose an auto loan, do your research on available APRs and loan terms, as well as whether you can make loan prepayments without a penalty. You’ll also want to consider how quickly your vehicle will depreciate, since it doesn’t make sense to make high payments on a vehicle that’s no longer worth very much. Mission Fed’s free Auto Loan Guide is a great resource for discovering what information you need and the right questions to ask, as well as some helpful Auto Loan tips, to help you make an informed decision when you apply for your car loan. At Mission Fed, we also offer a variety of perks for shopping with our Preferred Auto Dealer Partners, including Auto Loan Express Check for a faster, easier purchase and 0.25% discount on your approved and qualified Mission Fed Auto Loan rate. Mission Fed can help make your car buying experience as simple as possible. We asked what was most important to our survey participants when buying a new car so we can help meet our members’ needs. The largest group—39 percent of participants—said that fitting within the budget was the most important factor, while 36 percent of participants said that the new vehicle was a necessity for their work or family. Bottom Line Auto Loan Rates – Lower interest rates mean you could pay less monthly and over the life of your loan. Auto Loan Express Check – Auto Loan Express Check makes your Auto Loan car purchase easier and saves you an additional 0.25% on your approved loan rate. Autoland – Buy through Autoland with your Mission Fed Car Loan and you’ll enjoy a 0.25% discount on your approved rate. Rate Break Program – Earn a potential rate discount of 1% after every six consecutive on-time monthly payments, up to three times, for a potential discount of up to 3%, with a qualifying loan. Personalized, Award-winning Service – Because Mission Fed is a local organization, you’ll enjoy individualized customer service and loan experts you can trust and meet with in person. And, because they’re able to get to know you, they can help meet your unique needs. At Mission Fed, we’re committed to helping you find the right vehicle and the right Auto Loan for you when you need them, and we want to make the process as easy to understand as possible. You are our priority, and our low Car Loan rates, great service and partners like Autoland can help you get the car you need at a price you can afford. Let’s be honest—most of us love our cars! And beyond that, ridesharing is often only financially viable and convenient when you’re not traveling far. In fact, when we asked whether survey participants felt using rideshare options are sufficient, just over 10 percent of those surveyed said yes. In contrast, nearly 90 percent of the survey participants said that having a personal car is a necessity. While ridesharing is becoming more popular, most San Diegans prefer to have their own car. Since San Diego County stretches over 4,500 square miles and is larger than Rhode Island and Delaware combined, that’s not surprising. Most people need to travel significant distances for work, school or other needs, and having a car makes that much easier. If ridesharing isn’t enough and you need a car to make your commute easier and more enjoyable, Mission Fed can help you get the Car Loan you need to get driving. There are a lot of factors that contribute to someone choosing a new car, but how often are most San Diegans getting a new vehicle? 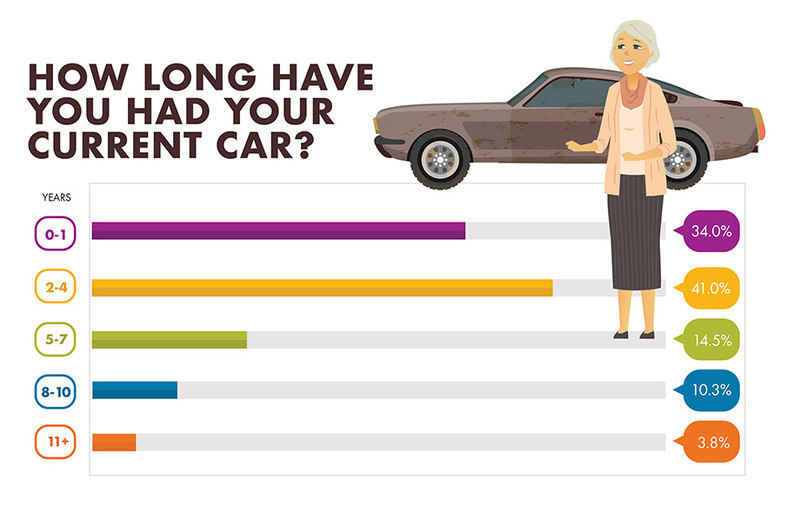 We asked our survey participants how long they had their current car, and 75 percent of participants have had their car for four years or less. No matter why they’ve chosen to get a new vehicle, many people find themselves buying another vehicle before they expected to do so. As a result, the costs could be more than they expected. Discover how an Auto Loan refinance with Mission Fed can get you into a loan with better terms, helping you save money in the long run and making your monthly payments more manageable for your budget. 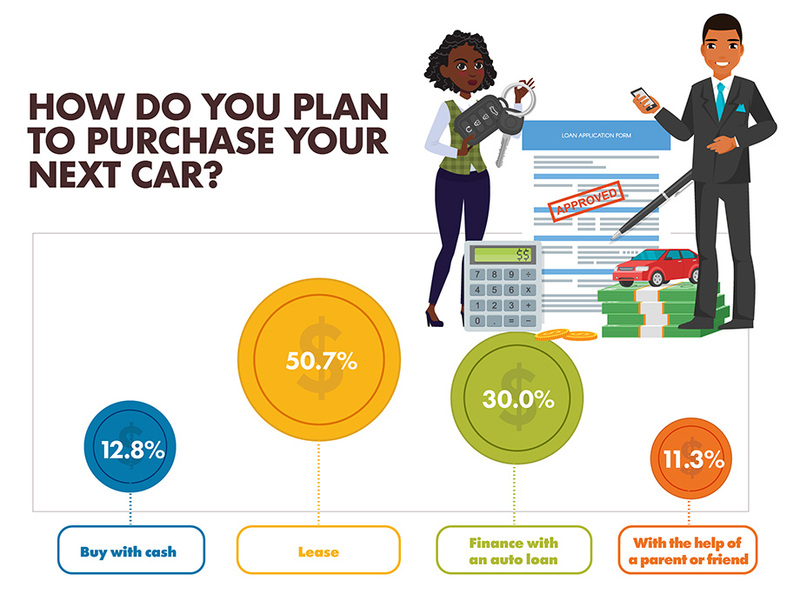 We were interested to learn whether San Diegans plan to lease, buy with cash or finance their next vehicle, and over 50 percent of those surveyed said they plan to finance with an auto loan. While 13 percent of survey participants plan to lease their next car, it’s important to understand the pros and cons of leasing if you’re considering it. Leasing can be a good option if you like having a new car every couple years or need a lower payment and don’t have a sizeable down payment. Jones also points out, “If you end up loving your leased car, you can choose to purchase it at the end of the lease.” In that case, Mission Fed is happy to help you. Learn how to buy out your lease with an Auto Loan that works for you and your bank account. A leased car is likely to remain under warranty, so mechanical problems should be covered, but scrapes and excessive wear will not. Also keep in mind that you won’t build equity with your payments, so when you return your leased car you’ll have to start over with a new lease or purchase. Additionally, there are often annual mileage limits and insurance requirements that could end up costing you in the long run. Because of the restrictions and lack of equity associated with a lease, many people opt to buy instead. Most buyers prefer to use an Auto Loan rather than pay for the vehicle in cash because it’s difficult to save up the money you need to pay cash for a reliable vehicle in full. Even if you do have that much money saved up, using your entire savings is risky. Financing, on the other hand, allows you to purchase a new car without a large lump sum of cash. You’ll make monthly payments on your loan, allowing you to build equity, and once you’ve finished your payments, you’ll own the car outright. At Mission Fed, you could qualify for up to 120 percent financing, which means you can get your new car even if you don’t have any savings for a down payment. Whether you finance the entire cost or put down some cash for a down payment, Mission Fed can help you find an Auto Loan with a great low rate and a term that works for you and your budget. Should you lease or purchase a car? How much will your auto payments be? Should you take a rebate or low-cost financing? Should you accelerate your auto payments? Stop by any of our more than 30 branches today and discover how we’re putting people before profit when it comes to helping you find the right Auto Loan for you. We want to help you get into the car you want at the monthly payment you need, without paying too much. At Mission Fed, your success is our bottom line. The content provided in this blog consists of the opinions and ideas of the author alone and should be used for informational purposes only. Mission Federal Credit Union disclaims any liability for decisions you make based on the information provided. References to any specific commercial products, processes, or services, or the use of any trade, firm, or corporation name in this article by Mission Federal Credit Union is for the information and convenience of its readers and does not constitute endorsement, control or warranty by Mission Federal Credit Union. Liz Schrock is VP Consumer Lending Operations at Mission Federal Credit Union. She has been a member of credit unions since her childhood, which led to her career in the financial industry. Working in many aspects of lending, consumer lending is her passion, and nothing brightens her day like seeing a member have that dream car in the driveway. With over 20 years of experience, Liz knows how important it is to provide members with quality loan products and help them through their financial needs when they need it most. Do you have questions about financing a new or used car? Mission Fed and Autoland can help you through the car buying journey. You can apply for an Auto Loan online, make an appointment at any of our branches or, learn more by downloading our free Auto Loan Guide.